Royal Rife's Microscope... How Does it Work? - excerpt from John Crane, one of Royal Rife's research partner. Consisting of 5,682 parts and able to achieve resolutions of up to 100,000 diameters. Royal Rife's inventions include a heterodyning ultraviolet microscope, a micro-dissector, and a micromanipulator. When you thoroughly understand Rife's achievements, you may well decide that he has one of the most gifted, versatile, scientific minds in human history. 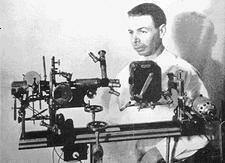 By 1920, Royal Rife had finished building the world's first virus microscope. By 1933, he had perfected that technology and had constructed the incredibly complex Universal Microscope, which had nearly 6,000 different parts and was capable of magnifying objects 60,000 times their normal size! 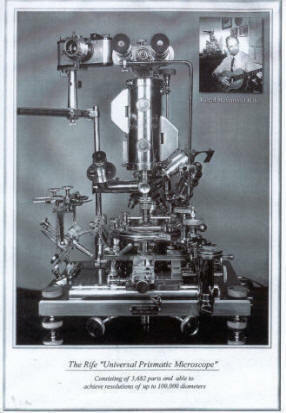 With this incredible microscope, Rife became the first human to actually see a live virus, and until quite recently, the Universal Microscope was the only one which was able view live viruses. Royal Rife Standing next to his No.1 Prismatic-Virus Microscope, Showing Camera, for Still and Motion Micrography. The atoms that come together to form a molecule are held together in that molecular configuration with a covalent energy bond which both emits and absorbs its own specific electromagnetic frequency. No two species of molecule have the same electromagnetic oscillations or energetic signature. (This allows frequencies to be directed at just the exact virus, bacteria, etc... attacking the body, without harming any other tissue or organisms.) Resonance amplifies light in the same way two ocean waves intensify each other when they merge together. The result of using a resonant wavelength is that micro-organisms which are invisible in white light, suddenly become visible in a brilliant flash of light when they are exposed to the color frequency that resonates with their own distinct spectroscopic signature. Royal Rife was thus able to see these otherwise invisible organisms and watch them actively invading tissues cultures. Royal Rife's discovery enabled him to view organisms that no one else could see with ordinary microscopes. More than 75% of the organisms Rife could see with his Universal Microscope are only visible with ultra-violet light. But ultraviolet light is outside the range of human vision, it is 'invisible' to us. Royal Rife's brilliance allowed him to overcome this limitation by heterodyning, a technique which became popular in early radio broadcasting. He illuminated the microbe (usually a virus or bacteria) with two different wavelengths of the same ultraviolet light frequency which resonated with the spectral signature of the microbe. These two wavelengths produced interference where they merged. This interference was, in effect, a third, longer wave which fell into the visible portion of the electromagnetic spectrum. This was how Dr. Rife made invisible microbes visible without killing them, a feat which today's electron microscopes still cannot duplicate. Rife Micrograph of Bacillus Typhosus (Typhoid) Magnification: 23,000X on 35 mm film--Enlarged 300,000X. By this time, Dr. Royal Rife was so far ahead of his colleagues of the 1930's(! ), that they could not comprehend what he was doing without actually traveling to San Diego to Dr. Rife's laboratory to look through his Virus Microscope for themselves. And many did exactly that.